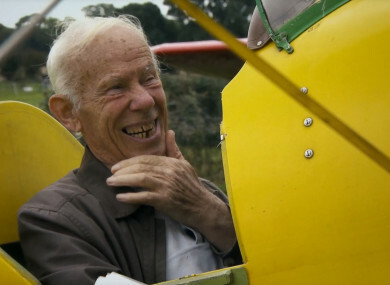 BOBBY COOTE WAS a man with a simple mission: he wanted to fly, and in a new film coming out next week, that’s exactly what the 80-something bachelor farmer from Co Cavan did. Director Frank Shouldice said the idea literally came to the doorstep of his cinematographer, Dave Perry, who had been out on his flying paramotor (a powered paragilder) one day in Bailieborough five years ago. “He saw this little white dot underneath him at a couple of points,” Shouldice says. Perry soon realised it was a car but thought nothing more of it. Later he would get a knock on his front door. Shouldice and Perry were intrigued by Bobby and went to visit him at his home. There they found his older brother Ernie. It was talking to Ernie, and observing the way the two elderly brothers lived and interacted, that made Shouldice think there was something that could be more than a short film. It deserved to be longer and richer. It started a five-and-a-half year process of filming and editing The Man Who Wanted to Fly. Shouldice and Perry followed the journey of Bobby and Ernie, along with their neighbours, family and community as the older Cavan native went about fulfilling his flying ambition. “We got to know them, they got to know us,” says Shouldice of the Cavan community where the story takes place. Of the finished product, Shouldice says “it’s not what you’d expect it to be”. Shouldice believes Bobby and Ernie represent a lot of people living in rural Ireland that are isolated by technology and the ever-changing world, but also refuse to be bogged down by loneliness. They do not abandon their dreams. He says people come out of screenings of the movie “generally lifted”, because people can relate to it, whether they can recognise it from their own past or through family members. He says a lot of goodwill was shown to Bobby, and as an extension the filmmakers, even during the slow periods when it seemed Bobby’s plans might not work out. “We couldn’t have made the film without that [support],’ the director says about the Cavan community. He says it was ordinary people – such as the family which owned the meadow that would become the landing strip – who just got behind Bobby’s dream no matter how fantastical, or ‘even absurd’, it may have seemed. “They weren’t rationalising it,” he says of Bobby’s many supporters. “They just said: ‘Let’s just go with it.’ The generosity of people is something that filters through in the film. The feelings in the film are genuine. I look at the people in it and I see what they bought to it… It was them who made it possible, not us actually. The Man Who Wanted to Fly has a preview screening at the Odeon Cinema in Cavan Town on 26 March and opens in cinemas in Dublin, Galway, Cork and Cavan on the 29 March. Email “How this 80-something Cavan bachelor's wish to fly became a film about family and community”. Feedback on “How this 80-something Cavan bachelor's wish to fly became a film about family and community”.